Hi, I read all your posts, and while I don’t always comment I’m fascinated by your knowledge and experience. We are lucky to have a great view from our apartment of the East River and all its fascinating traffic. Is there any way to learn more about tugboats while riding on one? Sorry I took so long to respond. I wrote and posted an entire reply to you – but I just noticed it was gone. It looks like either wordpress or I glitched and it didn’t post. Sorry! Unfortunately, there are no tug-rides in NY harbor that I know of. Working tugs can only carry maritime licensed personnel, and the two historic tugs (Tug Pegasus and Tug W.O. Decker) that have offered tours in the past, are not doing so in 2016 (as far as I know). The WHC offers tours of the working harbor (starting in May) – about the past, present and future of our working waterways – our container ports, shipping terminals, transport vessels, etc. which does include the tugboat industry. But I would not say our narration is tugboat oriented. That being said, we do see a lot of them on our excursions (especially the Port Newark Tour)! I’d suggest signing up for our e-newsletter at http://www.workingharbor.org to keep updated on upcoming tours. I would also suggest you check out http://www.fireboat.org – although not a tug, the historic fireboat John J Harvey offers rides periodically throughout the summer months – keep and eye on their schedule for when! 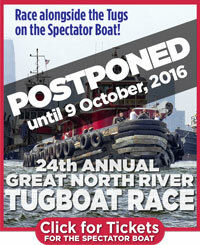 Also, every Labor Day Sunday (this year on 9/4/16), the WHC hosts a tugboat race on the Hudson River! There are anywhere from 12-22 tugs racing down the Hudson, with an additional 6-7 vessels (like the Circle Line Spectator Boat) who race alongside, but aren’t eligible for a trophy, because they aren’t a tug! Following the race, there are more competitions – line-tossing, (tug)nose-to-(tug)nose pushing, spinach-eating contests (kids division too!) and the ever popular “best mascot” contest! Festivities start at 10am. Pier 84 (west 44th/12 Ave). Planning a NYC trip this summer. Please advise best harbor cruise that would address container ships. Are there container ship tours? Thank you. There aren’t container ship tours – they are designated MARSEC secure areas – however the Working Harbor Committee conducts tours that visit the Port Newark container port – the 3rd largest in the nation. WHC Hidden Harbor tours usually run from June to Sept – in conjunction with Circle Line Sightseeing. The tours are 2-2.5 hours long and depart from Pier 83 (W43 Street/12 Ave) – motor down the Hudson, along the Brooklyn waterfront and past the Red Hook Container Terminal and the Brooklyn Cruise Terminal, through the Kill Van Kull – through which all container traffic travels to reach the container terminals of Port Newark – under the Bayonne Bridge and on to Port Newark. On the return journey, we stop by the Statue of Liberty for a photo op before returning to Pier 83. WHC Hidden Harbor tour schedules will not be available until May. Additionally, NYMediaBoat.com is a unique way to get close to the container ships. A zodiac inflatable speedboat style ride which I have yet to try – so my recommendation is based on others experiences. Contact Bjoern Kils and I am sure he can tell you what options he has. I know a great deal about the history of the Port of NY as a tug Captain’s son in the 1950s on through my career at Moran Towing Corp for 35 years as head of all operations. How do I get in touch with the Committee members to contribute what I know. Thanks for visiting my blog, I’m glad you liked it.